To reflect the unique food environment and practices of the Pacific, the Secretariat of the Pacific Community (SPC) Public Health division developed Dietary Guidelines for healthy eating to promote and protect the health and future of Pacific Island peoples. With such a diverse food supply, it can be difficult to place some pacific foods into the USDA 5 food group system. For example, ‘ulu, otherwise known as breadfruit, is a fruit but also has many similar properties and functions like whole grains as well due to its high carbohydrate and fiber content. 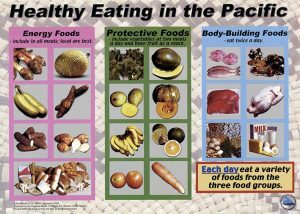 Therefore, guidelines for healthy eating include a series of leaflets and fact sheets that focus on traditional Pacific foods, food security, and health issues in the Pacific region. Healthy eating guidelines for adults and children are divided into 3 main food groups. Description The recommendation is that these foods should be included in all meals contributing to about half of the food you consume each day. The foods in this group are high in vitamins and minerals. These foods are recommended to be included in all meals and snacks contributing about one third of the food consumed each day. The foods in this group are high in protein and is recommended to be eaten twice a day in small amounts. The recommendation is that these foods should be included in all meals contributing to about half of the food you consume each day. The foods in this group are high in vitamins and minerals. These foods are recommended to be included in all meals and snacks contributing about one third of the food consumed each day. The foods in this group are high in protein and is recommended to be eaten twice a day in small amounts. 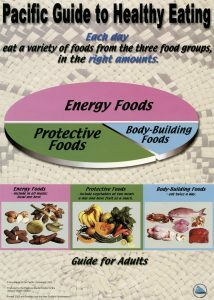 Examples of each of the foods from the Pacific that fit into these categories are shown in the image below. 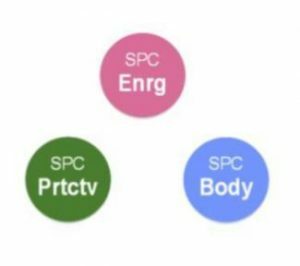 The overall key messages to the SPC Dietary Guidelines are to consume a variety of foods each day from the 3 food groups. However, food should be consumed in moderation as too much of any one food can be unhealthy. Foods should be consumed in recommended amounts. In addition, every effort should be made to consuming foods that are locally sourced. See the image below for a depiction of the key messages of the SPC Dietary Guidelines. 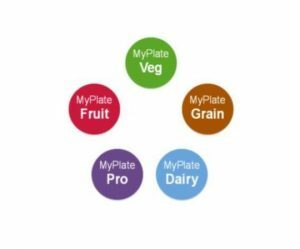 The Pacific Food Guide allows users to identify with the origin of specific Pacific foods and see how these foods fit into both dietary guidelines using a unique set of pins (see image below). By grouping foods into its origin it allows for readers who may not be familiar with either/neither dietary guidelines to use the Guide. Pacific Based Dietary Guidelines by University of Hawai’i at Mānoa Food Science and Human Nutrition Program is licensed under a Creative Commons Attribution-NonCommercial-ShareAlike 4.0 International License, except where otherwise noted.